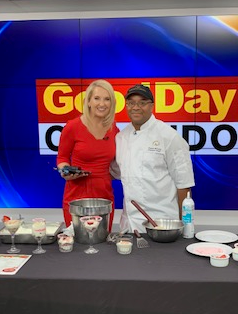 Clarion Inn Lake Buena Vista and Bella Vista, a Rosen Venue are serving up fresh new flavors this year thanks to the newest member of our culinary team, Executive Chef Preston McCord. Originally from Baltimore, Chef Preston has brought with him a wealth of experience in corporate dining. Before joining the Clarion team, Chef Preston worked as a banquet chef for Hilton, creating satisfying meals for hungry crowds as large as 10,000 diners. In 2016, he was honored by Compass as their Chef of the Year. Now he’s bringing his rich background as a musician, athlete, and chef to lucky diners at Boardwalk Buffet at Clarion Inn Lake Buena Vista and Bella Vista, a Rosen Venue. Long before he was creating culinary masterpieces, Chef Preston was making music. He received his four-year degree in music and played gigs as a jazz saxophonist. So just how did he find his way from his music degree to his culinary arts degree? Chef Preston credits a variety of events in his life at the time, but the most significant was when his dad said “cut your hair and get a real job.” While musicians and chefs might not seem to have much in common, Chef Preston said that for him, the transition from music to food was a natural one. In fact, he feels that his background as a jazz musician actually helps him in the kitchen. Creating meals for hungry guests with specific needs requires improvisation and quick thinking, just like jazz. Before his culinary epiphany, Chef Preston also played for minor league baseball team the Hagerstown Suns. While he might not be playing baseball anymore, Chef Preston still draws on his experience as an athlete in unexpected ways. In 2012 while working at Hilton, he had the honor of cooking for the Baltimore Ravens. As their chef for the duration of their stay at the hotel, Chef Preston was able to tap into his experience as a hungry athlete to create meals that would sustain the team and ultimately help lead them to victory. As a rule, Chef Preston likes to keep his meals simple and fresh. Meals shouldn’t be too spicy or overpowering, he says, as he prefers to showcase the fresh ingredients rather than douse them in sauce. He enjoys incorporating healthy food trends into his meals too, such as collaborating with local farmers to get the best tasting ingredients. When creating menus, Chef Preston says he sets aside his own personal preferences and instead focuses on the needs and requests of the diner. Menus created for a family buffet will differ from those for a catered corporate event in order to best suit the diners’ palates. Diners with food allergies are in good hands with Chef Preston, who has lots of experience preparing meals for those with severe allergies and intolerances. Like any great chef, Chef Preston’s secret to creating a perfect meal is a talented, well-organized team. As executive chef, he likes to lead his team by example, helping his staff learn to work smarter, not harder. He shares the valuable time management skills he’s learned after years of experience in corporate dining and encourages a high level of attention to detail. Thanks to his dedicated leadership, you can trust that even on his days off you’ll enjoy the same high caliber of excellence in your meals at Boardwalk Buffet and Bella Vista through the detailed work of his highly-trained staff. Are you ready to sample some of Chef Preston’s delicious meals? Host your next event at Bella Vista, a Rosen Venue and have it catered by Chef Preston and his team. Whether it’s a corporate event, a wedding reception, or a birthday party, he’ll guide you through creating a satisfying menu that your guests will love. Visiting Orlando for vacation? Stay at Clarion Inn Lake Buena Vista and dine at Boardwalk Buffet, where you can sample Chef Preston’s hearty breakfast and dinner spreads the whole family will enjoy. To learn more about hosting an event or planning a stay at Clarion Inn Lake Buena Vista, call 407-996-7236.